5 UNMISSABLE EVENTS THIS JULY!! Out and about in Oz? Here’s some things you should definately not miss out on! Here’s where Brisbane’s official Bastille Day celebrations will take place by the river at South Bank. Enjoy yourself with entertainment, French cuisine, wine, culture and music! Take the kid’s along and let them enjoy fun workshops, face painting, puppets and more! 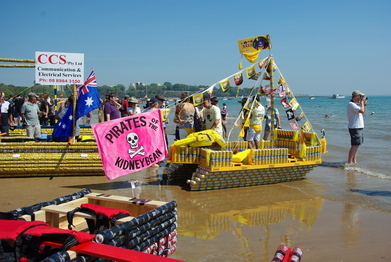 People will run to the beach to see it being invaded by unsual vessels made entirely out of beer cans! Also enjoy the live concerts, dances and weird beach competitions! Dating back to 1970, this is a duel between two Alice Springs Lions’ members. The camels in the race and definately move however others tend to sit down at the starting line! Enjoy displays of farming equipment and the livestock at Cairns Showground. Also enjoy yourself at events such as circus shows, wood-chopping events and competitions! There’s a fun park with rollercoasters for the kiddies, as well as as dodgem cars and other amusement rides. Artists from around Australia are featured at this event alongside Tasmania’s leading jazz musicians! This is a celebration of all jazz genres, old and new. The festival includes education, food, drink, visual art and more! There’s plenty going on with the film and dance too!